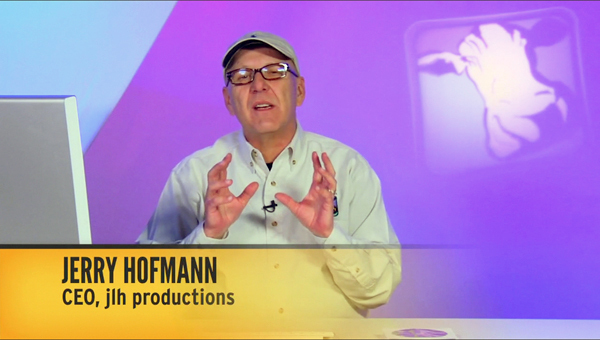 Final Cut Pro aficionado Jerry Hofmann’s 90 minute DVD provides a decade of experience about basic to advanced system, OS, hardware, and Final Cut Studio set up, and much more. Jerry starts with FCS and OS X installation strategies, discusses various hardware and software options, system, user, and AV settings, and finishes with how to set up an editing suite including which color to paint the walls (and why). Just about everything else Final Cut Pro hardware and software related is included. This is a must view for novice and expert, and a bargain at $49.95. The video DVD is divided into twelve informational categories. It includes AppleTV versions for each category in a separate Extras folder. Jerry’s presentation suggests solutions to issues which routinely arise when editing, and when using OS X. It also provides alternative approaches to avoid these issues. Information is also supplied about purchasing 3rd party hardware for Final Cut Pro, including an extensive discussion about media drives, capture boxes and cards, hardware scopes, and external monitoring. Screen captures for the procedures and products discussed complement static views of Jerry’s presentation. This combination of monologue, screen casts and grabs, provides an informative hour and a half.. Installation & System Preferences. 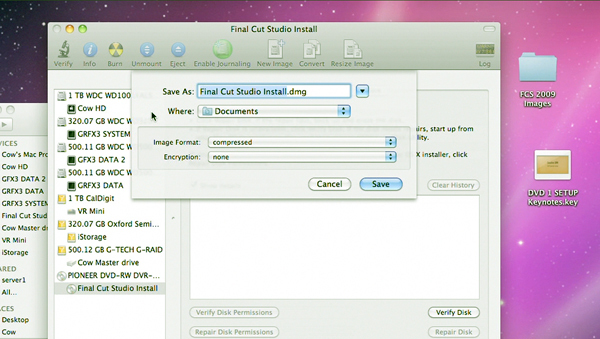 How is Final Cut Studio safely and quickly installed, and reinstalled if problems arise? How is OS X completely reinstalled after major OS updates or before a new version of FCS is installed? Jerry provides time-saving strategies to quickly and efficiently complete these tasks using disc images created from the OS X install, and FCS installer discs. He covers boot drive cloning procedures using utilities like Carbon Copy Cloner and SuperDuper, the minimum system requirements for installing the suite, the importance of high speed internet access when updating, using the software updater to bring the suite current, and “when” it is wise to install updates. Of importance, Jerry explains why these procedures are “best practices” for FCS users. 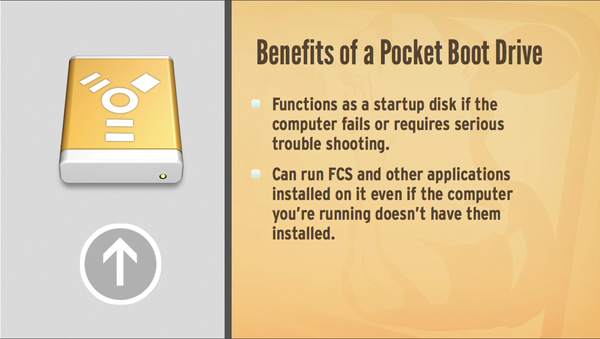 The benefits of creating and using an OS X pocket boot drive are also explained. Hardware Considerations. The minimum hardware necessary to run FCS is evaluated, including advice about Mac Mini or iMac systems. Jerry provides information on correlating your Mac purchase decision with the type of editing is contemplated. For example, if there is a need to compress large amounts of video for distribution, then a multi-core Mac is suggested. Custom application keyboards, which mouse to use, the utility of trackpads, and dedicated FCS3 panel devices are also explored. Advice is provided on purchasing blu-ray burners and discs, additional RAM, its installation and how to avoid slow system disk caching. I/O Considerations. The chapter relates to how input/output cards, boxes, and scopes are evaluated for use for inputting tape, color correction, and monitoring externally for broadcast and DVD. Capture devices, including cards and external boxes, are evaluated. These include the Kona series, Io HD box, and KiPro from AJA, and similar products from Blackmagic design and Matrox. He also suggests which purchases products make sense for boutique production companies. External video scopes are compared to FCS’s internal scopes and audio monitoring is covered. An important segment explains recommended media drives, for either external and internal use, and why video should not be captured to a boot drive. Jerry provides a simple procedure using two free applications to gauge which media drives should be used with what video codec and camcorder. User/AV/System Preferences & Settings. There are separate sections on how to set overall OS X system preferences to be compatible with Final Cut Pro, and FCP’s user and system preferences tabs. The latter review is lengthy and pure gold. 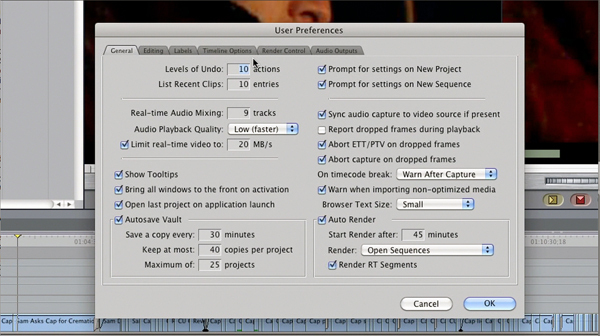 Similar explanations are provided for the AV and system settings within FCP. A number of other topics, including use of external drives, file storage, and editing suite set up and equipment are explained by Mr. Hofmann in detail and according to best practices. This DVD is a no nonsense, straightforward instructional experience that approaches basic to complex system configuration, settings, and hardware using a solid professional workflow. Jerry’s extensive working knowledge of both the application suite, the hardware necessary to run it, and 3rd party products provides insights not often found in similar DVDs. Apple should bundle it with every license it sells for Final Cut Studio. Both new and seasoned users will discover valuable information here.